The birds are surprisingly quiet this morning but the spectacular morning sky more than compensates for the lazy birds. 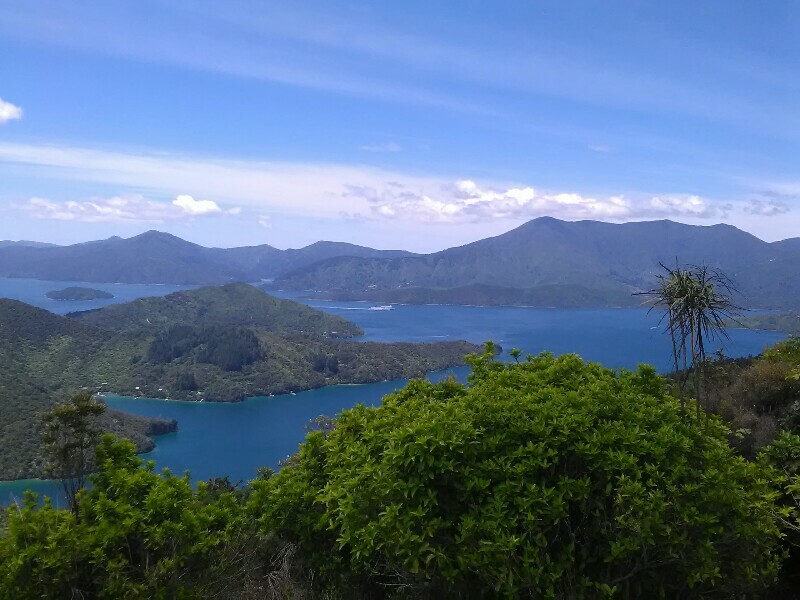 Again some amazing views of the sounds far below, while I hike on the fantastic track along the ridge towards Torea Saddle. From the saddle, the track gets slightly steeper and more narrow, the sun now shining relentlessly. No big deal though. On the contrary: I've been hiking for six hours and I'm feeling really, really good at the moment. The track, the views, the weather. Everything fits perfectly together. With noon approaching and being well ahead of schedule, I decide to make a 30 minutes detour up to a lookout point to have lunch there and enjoying the scenery. I'm about to leave when the Interislander Ferry I've been on 2 days ago appears from behind a hill. Amazing how small it looks down there in the sound! The remaining 3.5 hours to Davies Bay Camp are fairly unspectacular. About half way through, I meet Chris and Fabi, two German students. 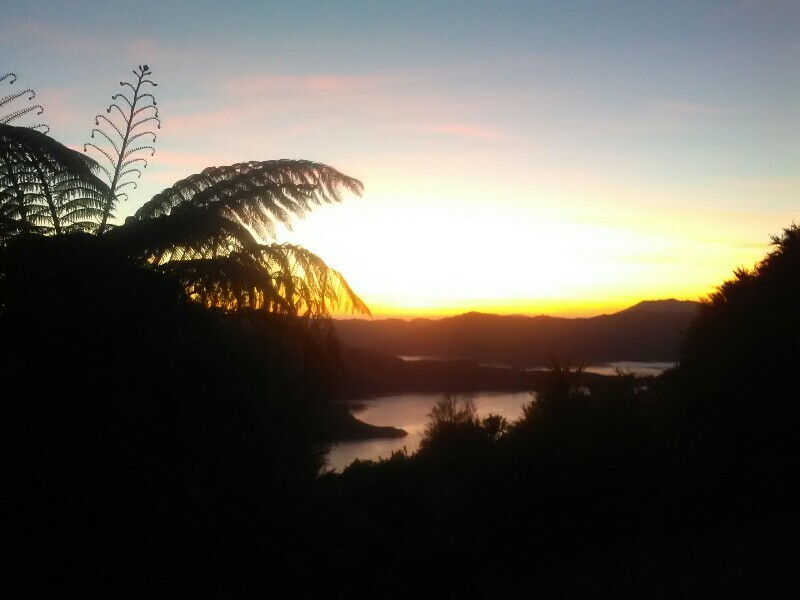 They just arrived in Wellington and only hike some sections of the South Island - day number 3 for them. It's nice to see some TA hikers again. 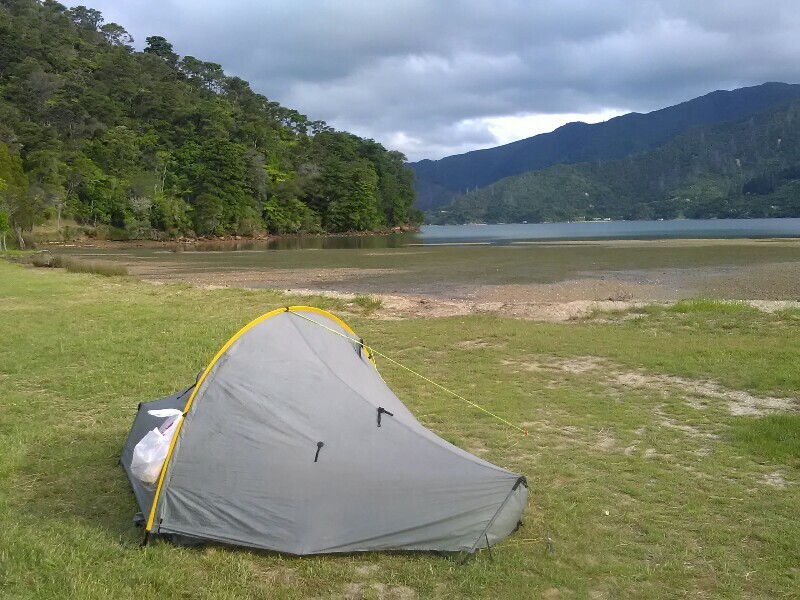 We pitch our tents right by the beach before jumping into the cold water to cool down. The location is a bit exposed (especially as strong winds are forecasted) but for me it's well worth the risk, as I just realized this afternoon that this is the last time camping at a beach until I'll get very close to Bluff... I'm gonna miss it! Last time at the beach for a long time!